My most memorable race/competition was junior year May 2017 SCHSL states track meet. It was the year I broke 4:30 running a 4:26 in the 1600. I realized at that point that I could push myself further. When I changed schools junior year from a private 2A school and began training and competing at the 4A level public school it became clear that the competition would be tougher, and racing was going to be quite challenging. 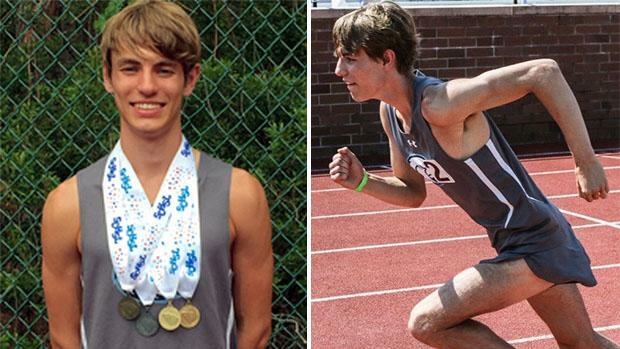 My senior year stands out the most as I medaled in four events at SCHSL states this year. If I could turn the clock back and change my athletic career in high school, I would have begun the intense training I have been doing the last two years, earlier in high school. The training I have been doing these last two years has helped me significantly in preparing me for the training I will be doing in college. The most difficult obstacle I had to overcome was being misdiagnosed with asthma since 10th grade. I experienced continual episodes of what was being diagnosed as asthma attacks, missing many days of school and practice until the end of cross country season senior year. After collapsing at Foot Locker senior year following bad chest pains and extreme shortness of breath, my parents researched and found a doctor who discovered I was not only misdiagnosed, but I was being improperly medicated for the last two years. The medication caused my lungs to tighten and I couldn't breathe, the more medicine I took the worse the conditions became. Once my new doctor started a new regiment for me I finally was able to breath properly and I was able to see improvements in my running. It was very difficult following SCHSL states realizing I no longer would be practicing with the team. Knowing the time, I have spent with my teammates and friends who I spent several hours a day everyday practicing with the past two years would be going away shortly was hard to grasp. I watched other runners who graduated the year before experience the same emptiness as me. I will miss my friends and the entire experience of being with this team the last two years. Also, I will miss Coach Max's camp, where all our friendships began and where our future plans were made. I would advise younger athletes to realize your potential and stick with running. It is a life long sport that you will always have and that you will make great friends along the way. Realize you can set a goal and work your way to reaching that goal. Make sure you build a good mileage resume during the summer it will pay off in the fall. Having changed schools from a small private 2A school in Hilton Head to a large 4A public school in Hilton Head was challenging. During the transition I trained with David Adams, who not only was inspirational, but he was extremely motivating for me. David spent a lot of time getting my confidence and helping me to become a part of the team. David continues to be there for me in helping to guide me not only in my performance on the track or course, but he has influenced me to make and achieve my goals in my life. Coach Max knew when I needed to be pushed and which direction to lead me in. He helped me to go beyond my limits. My family was incredibly supportive of my running. From the early morning practices several days a week to spending the entire weekend usually not in a fun spot, to wait around for races to begin and end. My brother sacrificed many weekends to be at my races, and support not just me but the team as well. The biggest impact has been senior year with my dad. This year my dad has made time from his job to do everything he could to be a part of my running career and my life. I am very grateful for all his sacrifices for me. I signed with Georgia Tech this past spring and I will be running cross country and track for Coach Drosky. I am very excited to be a part of this team. I can't wait to be a yellow jacket!! While at Tech I will major in Chemical and Biomolecular Engineering. After high school I hope to continue to improve my running and I hope to bring much success with the team under the guidance of Coach Drosky, as well as focus on my degree in engineering. I have never thought about coaching, but I could see myself doing that. I like to help people attain their goals and being able to help someone further themselves in running would be an honor. I would like to shout-out to my family. They have provided a support system for me and they have helped me to never give up. David Adams for always being there whether by text or phone! My brother who yelled at all my races, so I knew I needed to go faster. Coach Max for believing in me and knowing what I didn't realize about myself. In pursing my degree, I will be a part of research teams that are developing ways to improve our environment. With the onset of global warming and the various issues that have caused damage to our environment I would like to be part of the research team that develops a solution by using techniques in engineering to reverse the damages suffered in our environment. Being a part of repairing the atmosphere and helping to improve the lives of people as well as the vegetation on earth is something I have always wanted to do.